At the Media Set step of the wizard, specify rules for creating media sets. For details, see Media Sets. In the Media set name field, define the pattern according to which created media set(s) will be named. The default variables are #%id% (the number of the media set) and %date% (the date of creation of the media set). %monthnumeric% — the month of creation of the media set (the month is shown as a number, for example, '01' for January). Do not create, always continue using current media set. If this option is selected, each subsequent backup session will write its backup set to the existing media set: it will append backup content to the content that was written to tape with a previous backup session. If, however, a backup set is started with a new tape, Veeam Backup & Replication will create a new media set for it. Create new media set for every backup session. 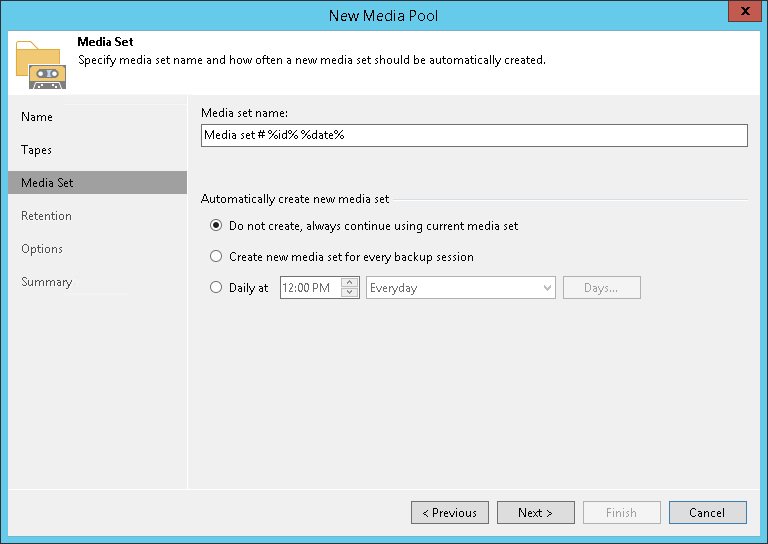 If this option is selected, a new media set will be created for each new backup session. Each backup session will write its backup set starting with a new tape. Daily at. If this option is selected, you can specify day and time when new media sets should be created. For example, if at the end of the week you send weekly media sets to offsite storage, you can schedule creation of new media sets at the beginning of each week.